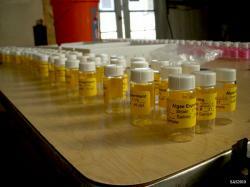 "This research project is part of a $49 million dollar DOE grant from the Obama Stimulus. 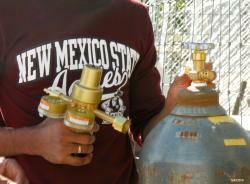 NMSU has been granted $4.5 million of that grant. 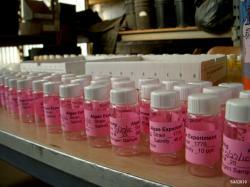 Over 100 people in the US are working on bio-fuel research. 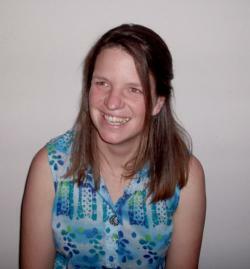 Out of those 100, 8 are housed at NMSU, and Wiebke J. Boeing is one of them. 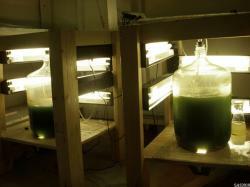 Associate professor, Wiebke J. Boeing, from the Department of Fish, Wildlife and Conservation Ecology along with Meredith Bartley (Masters student) and Alina Corcoran (Post Doctoral Researcher) have been performing algae research since March, 2010. The team purchased algae from Maine and started the growth process, which includes adding water, nutrients, and providing lots of light at NMSU in the lower level of Knox Hall. 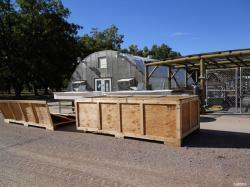 In May they moved the algae into the greenhouse at Fabian Garcia. 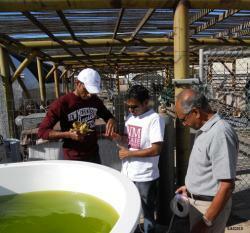 The focus of this research is on marine microalgae of the genus Nannochloropsis. 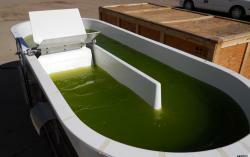 This algae is being researched because it is one of the fastest growing algae on earth. 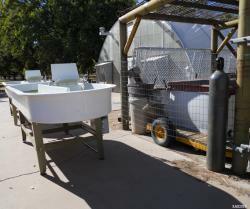 There are aquariums set up in this greenhouse, which allow other algae (competitors) and predators to invade the aquariums. 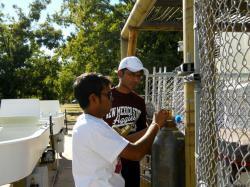 Dr. Boeing's group studies how to minimize those invading organisms. 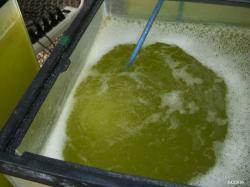 When algae are being stressed, they produce lipids, the basis for biofuels. Stressing the algae can be done by limiting nutrients or changing the temperature, lighting, and also the salinity levels. In the greenhouse the NMSU researchers have been adjusting salinity levels in each aquarium to see what psu (practical salinity unit) will be best suited to get the most amount of lipids. Ranges from 10-58 psu have been tested. From this research they have concluded that 22 psu and 34 psu are best for algae lipid growth, 34 psu being ocean salinity. 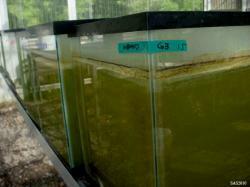 The next step in this research project is to change the pH levels in the aquariums. 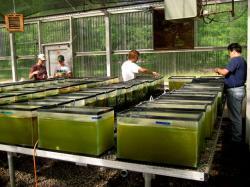 These research findings will benefit the bio-diesel pond projects." 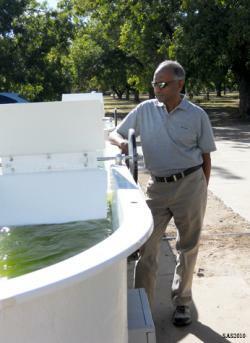 There are currently two algal raceways located at the south end of Fabian Garcia Science Center where small trials are being conducted by Dr. N. Khandan, Professor of Civil Engineering at NMSU, and his research team. These studies are being performed outdoors in prelude to larger scale studies that will begin in the near future. Within these initial raceways different species of algae will be grown and studied for about two years. These studies will help Dr. Khandan and his team determine how much oil can be gathered from each species of algae on trial. There is a CO2 tank and instrumentation that has been added to one of the raceways. 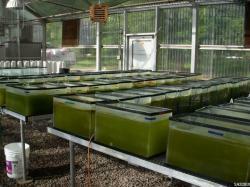 CO2 promotes a faster algal growth rate. If the pH level in the raceway drops below a pre-set level, the installed instrumentation will sense the decline and pump CO2 into the algae pond, bringing the pH level back up to the desired level. 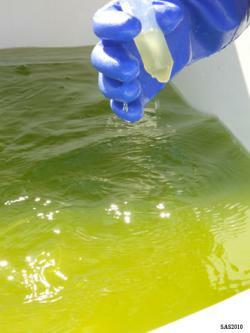 Once the algae is grown it will be harvested, concentrated, and made it into a paste. That paste will then be sent to chemical engineers collaborating on this project who will process it by removing the oil, and refining it to produce bio-fuels. 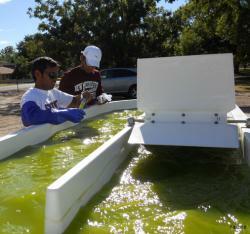 There will be algae waste and this will most likely be processed further for use as cattle feed at NMSU. For more information and photos regarding this research project amongst others please take a look at the website of Dr. N. Khandan located at: http://Web.mac.com/nkhandan. This research project is funded by the National Alliance for Advanced Biofuels and Bioproducts (NAABB) and the Environmental Protection Agency.